Whether we are employed, under-employed, unemployed, or working as unpaid childcare givers or other domestic/social work, most of us are workers, and that's why I think we need a workers' political movement. Big labor (except for the courageous example of the American Postal Workers' Union--APWU--which endorsed Sanders for president--a move not revolutionary but certainly outside of mainstream labor politics) is in the back pocket, front pocket, breast pocket, and all pockets of the Democratic Party. During election seasons, the treacherous Democrats give lip-service to being "pro-labor" but, in reality, do very little for labor while labor uses its forces and dollars to support the party. Of course, Republican candidates never pretended to be for the working-class, so they aren't treacherous, yet still the enemy of the working-class; however, there are many workers in that party who constantly vote against their own economic and social interests. Many workers don't belong to either major political party and they aren't Green or Socialist, either, but there is this one thing that unites us all: the need for a decent job with a LIVING wage and benefits that allow us to be free from the ravages of capitalism. The capitalists don't give any shits if you are a Republican or Democrat, or Green, or Socialist: they present a united front against We the Workers, so, We the Workers MUST present a united front against them. What would a worker's movement look like? I believe that it would be free from the capitalist parties of War and Wall Street and be oriented around working-peoples' issues--not just workers in the US, but workers around this planet that is mostly under the boot heel of US imperialism. The Wobblies say, "an injury to one is an injury to all," but in the realm of "Big Labor" I see very little solidarity with the people in the Arab world that are being murdered and displaced at a very alarming rate. Instead, I see complete solidarity with the Imperialists. I think most of us in the 99% can rally around workers' issues that would not only improve our lives, but create a world free from imperialism and savage capitalism if they are explained in ways that are constructive and not destructive. Like the IWW (International Workers of the World), I believe a workers' movement should consist of industrial unions combining with other workers in a general and larger workers' movement for real change and should be organized about workers' rights, not what the bosses, ownership class, or Democratic politicians want. When workers unite there is literally no limit to what we can achieve. 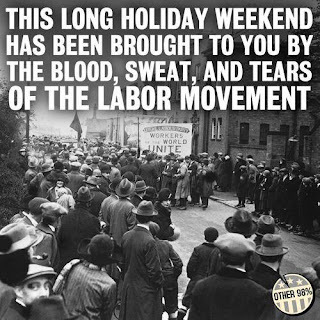 Happy Labor Day and happy struggles! Remember the struggle with workers and the Pullman Company. It ended when the US hARMY shoot down strikers. Just as did the first Ford strike when Pinkerton's shot down strikers. Not to mention using Gatling Guns to shoot at strikers in the mines out west. Were anu of the people killed given justice? I agree with the comments about big labor. Our IBEW local was on strike for 14 weeks and got hardly any help from the international. When other locals or unions in similar trades were on strike, we never supported them. Solidarity is unknown in United States labor unions in my experience. I also completely agree that we need a workers union that is free from any other party, especially the Democrats! Also that it should be world wide.